The bright little bird in McCleary’s piece is a construction of paint and bits of this and that, part of the picture, but also coming out of the piece to grasp real thorn branches. All of McCleary’s works have this interplay between two and three dimensions. She assembles her collages from all manner of unusual materials. Here she has used everything from paint and paper to thorn branches and miniature artificial vegetation. McCleary saw the work of God superintending over events in her life in her mid-thirties, when she became a follower of Christ. Already a successful artist in the Texas art community, when she became a Christian her work turned to biblical narratives. Her overt imagery did not hurt her sales and to this day her art continues to sell well. When I look at this delightful piece of art, I can’t help but see the bright goldfinch as a symbol not just for the Passion, but also for Mary McCleary herself. She is perched in the often prickly art world, a bold testament to God’s beautiful work of redemption. She is safe under the loving gaze of her omniscient and omnipresent Father, pointing everyone to the glory to be found in the broken Creation. 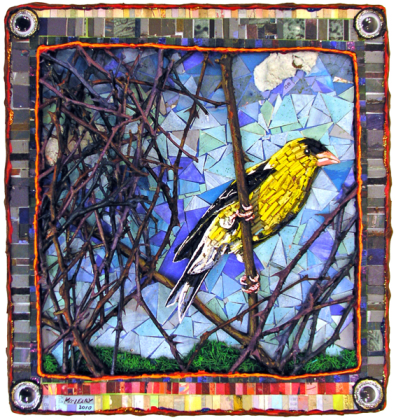 Mary McCleary: Goldfinch in Thorns, 2010, 11 x 11 inches, collage on paper. Ned Bustard is a graphic designer, author, illustrator, printmaker, and the creative director for Square Halo Books, Inc.: www.WorldsEndImages.com, www.NedBustard.com, www.SquareHaloBooks.com.